We are one of the leading manufacturers and providers of Polyurethane Wheels bonded on Cast Iron, Aluminium and Steel Cores, fabricated from superior quality of raw materials. These wheels are specially designed for heavy and extra heavy duty applications and are available in 4 inches to 20 inches diameter with customized PU tread. 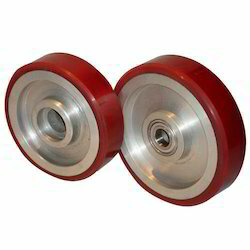 We provide these wheels in various forms like urethane wheels, polyurethane rollers and polyurethane load rollers which are made in our state of the art production unit with ISO 9001-2008 quality standard. We are one of the leading manufacturer and supplier of the finest quality Polyurethane Load Rollers. Manufactured by following ISO 9001-2008 quality standards, our skilled technicians ensure that our products surpass all kinds of quality tests. Renowned for its durability and cost effectiveness, these rollers are widely used in array of heavy and extra heavy applications. We also provide customizations of these world class rollers. Wheel Hardness: 70 (+/- 5) Shore D scale. Working Temp. : -30°C To +70°C. 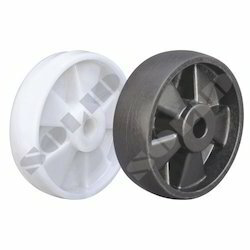 We are well known manufacturer of the wide range of Moldon Polyurethane Wheels. Made by using high grade raw materials with C.I Core and I-shape core shape, these are produced in our latest technology laden production unit. Each and every stage of production is supervised by our team of qualified technicians. With all international specifications in place, these wheels are of highest quality. 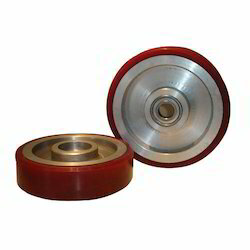 We are one of the leading manufacturer and supplier of the finest quality PU Rollers. Available in many varieties, these are manufactured using all international quality standards. Fabricated by using high grade materials such as Cast Iron, Aluminum, Steel along with Polyurethane, these rollers are designed to fit most of the industrials heavy and extra heavy duty applications. We provide these high quality rollers with industry leading price. Our organization is specialized in offering a fine quality range of Moldon Polyurethane Tired Wheel (Series 753 - Polyurethane on Aluminium Wheels), which are used in various material handling applications. These products are available at lesser prices to our clients and we offer these products with various qualities such as light weight, chemical resistant, durability and reliability. 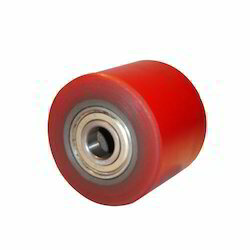 We are the supplier of the comprehensive range of Polyurethane Load Wheels (Series 754 - Polyurethane On Aluminium Roller). The product is the result of the hard work of our team of expert technicians, who specially designed these AL Core roller shaped wheels for heavy and extra heavy duty applications. High quality raw materials are used in very innovative fashion with the use of latest technology to maintain its abrasion resistance, high performance and long service life. 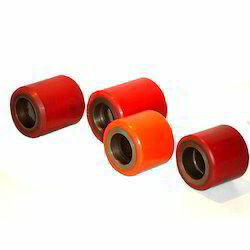 We are well known manufacturer and suppliers of the wide range of Urethane Wheels. Made from finest quality cast iron, aluminium and steel cores and following international specifications, these are extensively used in heavy duty applications like forklifts, pallet trucks, stackers, as guide rollers, technical wheels and allied power towed applications. 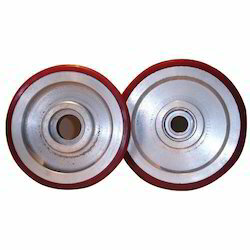 We provide these wheels in 4 inches to 20 inches diameter. Highly acknowledged for its attributes like durability, reliability and high performance, these can be customized as per client’s requirement that too at very competitive price. 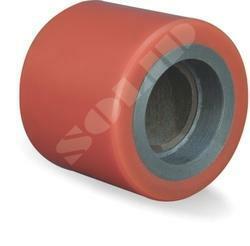 We manufacture a wide assortment of Polyurethane Rollers. One of the best quality raw materials such as liquid cast polyurethane is used in fabricating these high performance and durable rollers. Used in various heavy and extra heavy duty applications, these are apt for Pallet trucks, Strackers, Hoists, Forklifts and Other power towed applications. Available in array of specifications, these can be customized as per client’s needs. Our range of Polyurethane Pallet Truck Roller (Series 714 - Polyurethane On Cast Iron Roller) is well known for its international quality, durability and reliability. Fabricated from superior quality raw materials, these core shaped C.I rollers are extensively used in array of industries. Made in our latest technology equipped production unit by team of dedicated technicians, these rollers are known for its specific design, durability and quality performance.